Sitor fuse-link 450A, AC 800V, for 6QG12. SITOR semiconductor fuses 3NE4337 710A, AC 800V. Siemens company offers fuses for all applications, such as device, line, system, and plant protection. Fuses protect them in case of overload and short-circuit. They ensure fast disconnection and safe. For example, to minimize the effect of a short-circuit, they allows to protect property as well as lives. You can find all the common systems on the market – from LV to DIAZED, NEOZED, or Class CC fuse systems through to cylindrical fuse systems. SITOR semiconductor fuses protect expensive devices and system components such as UPS systems, converters with fuses in the input and in the DC link, and soft starters for motors. 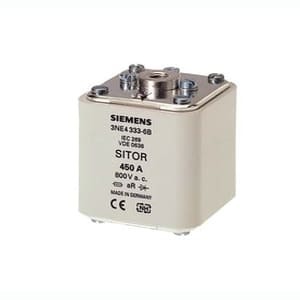 They protect power semiconductors from the effects of a short circuit because the super-quick disconnect characteristic is far quicker than that of conventional LV HRC fuses. Panel mounting requirements have given rise to various connection versions and designs. SILIZED semiconductor fuses protect power semiconductors from the effects of short circuits because the super quick disconnect characteristic is far quicker than that of conventional fuses. They protect expensive system components and devices such as static relays, semiconductor contactors, converters with fuses in the input and in the UPS systems , DC link and soft starters for motors up to 100 A.
SILIZED is the brand name of the NEOZED fuses (D0 fuses) and the DIAZED fuses (D fuses) with super quick characteristic for semiconductor protection. The fuses are used together with fuse screw caps, fuse bases and accessories of the standard fuse system. SITOR cylindrical fuses is approved for industrial applications. They protect expensive devices and system components such as electronic relays (solid state), semiconductor contactors, converters with fuses in the input and in the DC link, UPS systems and soft starters for motors up to 100 A. They protect power semiconductors against the effects of short circuits because the super quick disconnect characteristic is far quicker than that of conventional fuses. The cylindrical fuse holders have been specially developed for the application of SITOR fuse links with regard to heat tolerance and heat dissipation and are therefore not recommended for standard applications. Cylindrical fuse holders and cylindrical fuse links comply with IEC 60269 and UL 512.